Multiple Linux client applications on a LAN can share the same SAN-based data as shown in Figura 1.12, “GFS and GNBD with a SAN”. 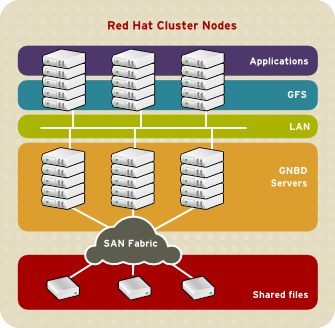 SAN block storage is presented to network clients as block storage devices by GNBD servers. From the perspective of a client application, storage is accessed as if it were directly attached to the server in which the application is running. Stored data is actually on the SAN. Storage devices and data can be equally shared by network client applications. File locking and sharing functions are handled by GFS for each network client.